The significance of fog deposition to increased water yield has been contested for many years, especially across the Otago region. Determining the importance of the role of tussock grasslands in the hydrological system is becoming increasingly important, especially over the summer periods when the demand for water for irrigation, recreation and domestic use is at its peak. Retaining tussock headwaters for fog capture may protect rivers from potentially running dry in the lower reaches during summer. Protecting our waterways from the headwater down is a fundamental part of catchment management. Therefore, understanding the function of tussocks throughout the hydrological cycle is essential for catchment management, both at the regional and national scale. Snow tussocks have been advocated as a significant component of the water balance. Consequently, from a catchment management perspective it can be viewed as advantageous to keep, or even augment, the cover of snow tussocks throughout the Otago region. The long-standing debate surrounding the relevance of fog in water balance has centered on the roles of evapotranspiration versus interception by snow tussocks. Grasslands in Central Otago have been traditionally used for pastoral farming, however the capacity for rolling hill country of low agricultural value grasslands to produce water warrants further investigation. Defining the relationship between catchment hydrodynamics and tussocks grasslands is therefore fundamental, especially when considering the maximisation of water yield at the catchment level. Precipitation is generally considered to be the only source of groundwater recharge, however in many upland areas the collection of fog by vegetation contributes significantly to aquifers (Schemenauer & Cereceda, 1994). Tussock grasslands are an iconic high-country landscape, and a fundamental component of water resource management. Land covered by Chionchloa rigida (native snow tussock) have higher water yields than land covered by pasture and forestry (Davie, Fahey, & Stewart, 2006). Despite the recognition and acceptance of the significance of fog interception by tussock grasslands internationally, the subject is still highly contested in New Zealand. An integrated land management approach is required to protect both water supply and quality in New Zealand (Mark & Dickinson, 2008). Therefore, further investigation into the tussock fog-deposition debate is imperative to allow for the maximization of water yield at the catchment level. Investigation into the potential significance of fog to water yield is being conducted in Timber Creek, Central Otago (Figure 1). Precipitation can be identified in many forms, both frozen and liquid. To understand the importance of fog in the hydrological system, it is essential to recognize the way different forms of precipitation interact with the environment. The dominant vegetation cover at Timber Creek catchment is snow tussock, typical of most high country grasslands in Central Otago. Previous research suggests that the morphology of the snow tussock tiller enables the plant to intercept fog at greater rates than other vegetation cover (Ingram & Mark, 2000). Accurate water balances include not only precipitation but also fog and horizontal precipitation; therefore multiple methods are required for in-depth analysis. The influence of fog on the Timber Creek catchments water yield is investigated through a variety of methods, including water balance, direct capture of fog and stable isotope analysis (2H and 18O) of rain, fog, and subsurface water. Figure 1: Study site at Timber Creek (June 2014). Preliminary results suggest that fog deposition is a significant contributor to water yield in the Timber Creek catchment. The amount of fog collected is consistently greater beneath the fog collectors compared to the rain gauges (Figure 2). Thus it appears that the fog may be an important contributor to water balance in this catchment. The relationship between land-use, vegetation cover and water yield is fundamental for catchment management, especially in the upper reaches were changes in the environment could influence the volume of water available downstream (Mark & Dickinson, 2008). With reference to the preliminary results from the Timber Creek experiment, it would therefore be considered valuable to maintain a dense cover of tussock, to augment water yield, reducing the potential for the stream to run dry over the summer period. 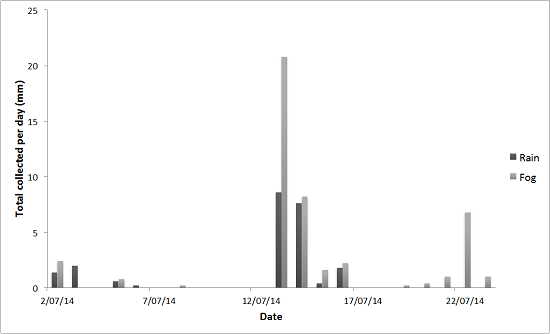 Figure 2: Quantity of fog vs rain collected in the Timber Creek catchment July 2014. Davie, T. J., Fahey, B. D., & Stewart, M. K. (2006). Tussock grasslands and high water yield: a review of the evidence. Journal of Hydrology (NZ) , 45 (2), 83-94. Mark, A. F., & Dickinson, K. J. (2008). Maximizing water yield with indigenous non-forest vegetation: a New Zealand perspective. Front Ecol Environ , 6 (1), 25-34. Alice Trevelyan is a MSC student and Dr Sarah Mager is a senior lecturer at the University of Otago. Peter Wilson works at Fish and Game Otago. Alice, an awesome article in regards to hydrology that is fairly understudied, amazing work! Preliminary results suggest that fog deposition is a significant contributor to water yield in the Timber Creek catchment. The amount of fog collected is consistently greater beneath the fog collectors compared to the rain gauges (Figure 2). 20mm of fog a day seems incredible. Was this consistent between fog collectors (replicates)? Land covered by Chionchloa rigida (native snow tussock) have higher water yields than land covered by pasture and forestry (Davie, Fahey, & Stewart, 2006). Yes, fog deposition remains a highly debatable subject. However, preliminary results have shown precipitation collected under the fog collectors in the Timber Creek catchment to be consistently higher than that collected in the rain gauges. It is also important to remember that as demonstrated by figure 2 it is not strictly 20mm a day, these values are highly variable, and are dependent on the prevailing weather conditions.